Over the past year or so, Thinkway Toys has released an exciting line of Disney·Pixar toys. The collection originally sold exclusively at Toys R Us, but you may have noticed that much of the line has now migrated to other retailers such as Target and Walmart. 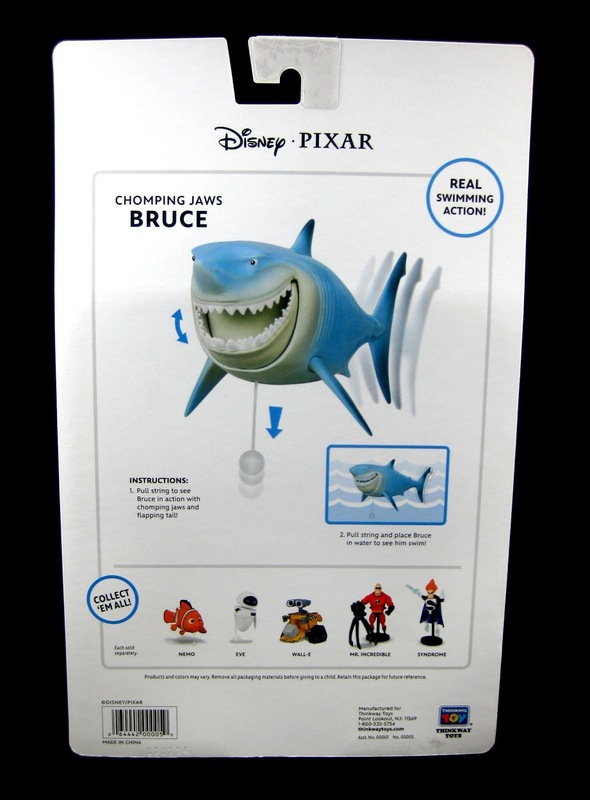 This Bruce deluxe action figure was one the latest items in the line to be released. It actually hit shelves back in March of this year (yes, this post is LONG overdue), but it's still easy to find in stores (along with Nemo, which I reviewed yesterday). Check out the cardback and more details below! This plastic figure measures about 6" long and features "real swimming action!" Just pull the string under his neck to activate movement in is tail fin and mouth. Place him in the water and he actually swims! Check out my very brief video below to see him in action! 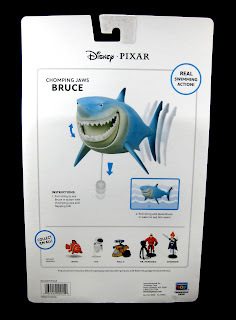 If you want a more detailed unboxing video (which demonstrates his swimming action in water) check out this YouTube video HERE (thanks to SEO Toy Review). This is a really fun product that works well, however, if I was to say anything negative about it, I'd say this...While it is a well made little toy with some nice paint and detailing, the $19.99 price tag seems a bit too expensive if you ask me. Luckily I got this one on sale! Be on the look out for the other five figures in this assortment: Wall·E, Eve, Nemo, Syndrome and Mr. Incredible! 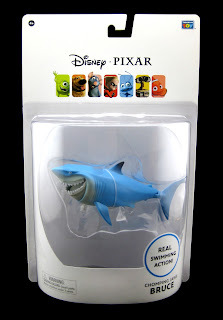 If you'd like to add this one (or any of the other characters) to your Disney·Pixar collection, head to your local Toys R Us, Target or Walmart to check for availability. If you'd rather just pick this up online, visit Amazon using the direct link below.